low-cost economy as opposed to the need of a generalized social protection floor. To face these challenges, a whole-of-government approach (i.e. coordinated policies embracing health, food, education, work etc AND rural development) and a participatory civic society are the two facets of the same coin. “Hunger zero” shares much of the big picture one can find, for instance, in Lester Brown’s 2012 “Full planet, empty plates”, but takes an additional political turn. The chapters have their own motto, a suggestive rendez-vous with history and politics. According to Voltaire, “one has been able to find, thanks to politics, the secret of starving to death those who, by working the land, feed the many others”. Or ideas from Roosevelt’s state of the Union message in January 1944. The extended table of contents is a good idea, opening a bird’s eye window to the hunger problematic on a few pages. The many interlinked political, social, economic or technical considerations are standing out very clearly. Here are a few examples, according to my own translation and occasionally making a free arrangement of items. A typology of modern famines. Possible links between overpopulation and hunger. What has been learned from the Chinese experience. Food situation in most populated and poor countries in the future. The demographic challenge can be managed. Much less the fearsome challenge of meet overconsumption. The risk of water wars. Hunger is political. No state, empty plates. Oil and mining countries are often land of famine. Globalization does not stop hunger. Multinationals ignore hunger, unless they generate it. What policies to produce food all around the world ? The increased scarcity of natural resources, a menace for industrial / conventional agriculture. Rules for a successful agriculture. Leaving behind the unique agricultural model. Big or small farming ? Social and education issues come first, technology transfer comes after. Can food really become a human right ? Hard time for the right to food. On the ground, the indispensable implication of numerous actors. The role of the UN. Fighting hunger with the weapons of the law. The case with “Fome zero” in Brazil. Funding the fight against hunger. In his conclusions, the author takes the stand that hunger can be eradicated. But he doubts that there really is the will to do so (for discussions with the author, go to his blog « Nourrir-Manger »). This is bad news because our earlier analysis of the “Lancet-University of Oslo report” on the political roots of public health miss-governance reached similar conclusions. As a matter of facts, health and food are the main entry points in making the ecological transition really work. For resilient socio-ecosystemic societies, social equity, ecological responsibility, cultural acceptance are the guidelines. Would we consider the transition on these foundations, the climate “crisis” could likely be managed half-way through. The vice-versa is not so straightforward. Brown, L, The eco-economy : building an economy for the earth. Earth Policy institute, W W Norton & Co, NY, 2001. Hopkins B, The transition handbook : from oil dependency to local resilience. Chelsea Green publishing, 2008. 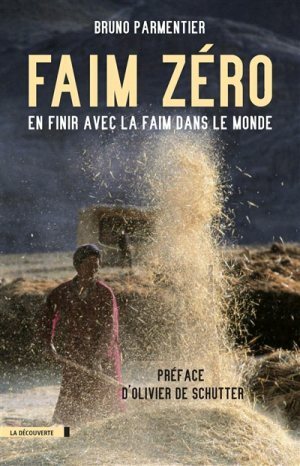 Frémeaux Ph, Kalinowski W, Lalucq A, Transition écologique – mode d’emploi. Les petits matins –Alternatives Economiques, 2014. Barra M, Hutinet L, Lecuir G, Economie et biodiversité (Produire et consommer dans les limites de la biosphère). Victoires Editions, 2014. Euzen A, Eymard L, Gaill F, Le développement durable à découvert. CNRS Editions, 2013. The latter offers two page concentrates on a large set of notions and concepts, embracing all that makes a society socio-ecosytemically resilient.